It’s never too cold for a trip to the seaside! So residents at Green Lodge wrapped up warm and headed to South Shields to breath in that sea air! 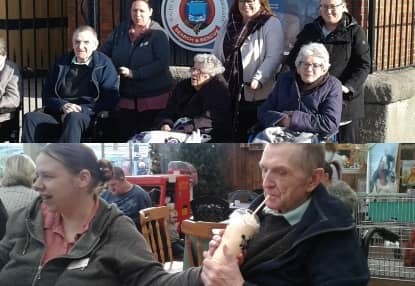 Before heading to the seaside town, the Billingham care home visited Clay’s Garden Centre to get into the festive spirit and take a look at the Christmas display. After seeing the giant Christmas trees, and nativity models, everyone enjoyed teas, coffees and cakes in the café, before climbing aboard the coach and taking the coastal route through Sunderland and up to South Shields. “I can see the sea!” Exclaimed numerous residents, as the coach took the scenic route through Sunderland and along the east coast. When everyone arrived at South Shields, it was time for a traditional fish and chips tea by the sea side. Everyone was even lucky enough to soak up a few rays of autumn sunshine by the sea! The trip ended with a visit to the nearby park and a relaxing stroll around the lake, then it was back to the coach for the ride back home.